Three men on a fishing trip had a lucky escape when a 40 tonne lorry careered off a road and crashed just 2ft from one of their tents. The men, from Hartlepool, were camping beside Auchenreoch Loch, Crocketford, nine miles from Dumfries, when the crash happened at 0400 BST on Saturday. 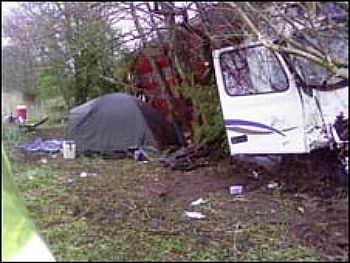 The lorry left the A75 Gretna-Stranraer road, went down an embankment, crashed into trees and landed beside the tent. The driver, 66, from Mauchline in Ayrshire, received serious injuries.